Match-fixing at the highest level in Turkish football has eroded all trust in the Turkish domestic game. As a report on this website detailed in March (click here to read), Fenerbahçe and others have been proved to be involved in the systematic fixing of games, with those involved including club presidents, senior officials, coaches and players. Many of those involved remain active in Turkish football. Some even played at the summer’s World Cup. Scandalous, you might think. But what have the authorities done about it? European governing body UEFA has suspended Fenerbahçe from European competition for a limited period … and that’s it. The club otherwise remain active in football, and they continue to play without any further domestic sanctions in the top division of Turkish football. Since the fixing has been exposed they have won the title (last season) and been runners-up in Turkey twice, participation uninterrupted. ENDER KUYUMCU contends that Uefa have failed in their duty to protect football, and that Uefa vice-president Şenes Erzik – who is also a Fifa ExCo member, and who admits on his Fifa profile he is a Fenerbahçe fan – has used his influence to ensure Fenerbahçe escape domestic punishment. Since the article in March that detailed the extent of Fenerbahçe’s fixing, this website has obtained a copy of the verdict of the Court of Arbitration for Sport (CAS) on the case between the club and Uefa – a document that the club and perhaps the authorities do not want you to see. It has not been made public. You cannot find it on any official website. It is an extraordinary document, 137 pages long, and it describes in great detail exactly how CAS agreed that a mountain of evidence shows matches were fixed, but also lays out, across clauses 575 to 577, how Uefa eventually drew a line under the matter without pushing for the maximum sanctions the governing body could have pushed for. Many fans, myself included, have been sickened by systematic, criminal, endemic match-fixing in Turkey, and we argue not only that Uefa could have pushed for those harsher sanctions but Uefa should have – and are obliged to – keep pushing for the harshest possible sanctions. 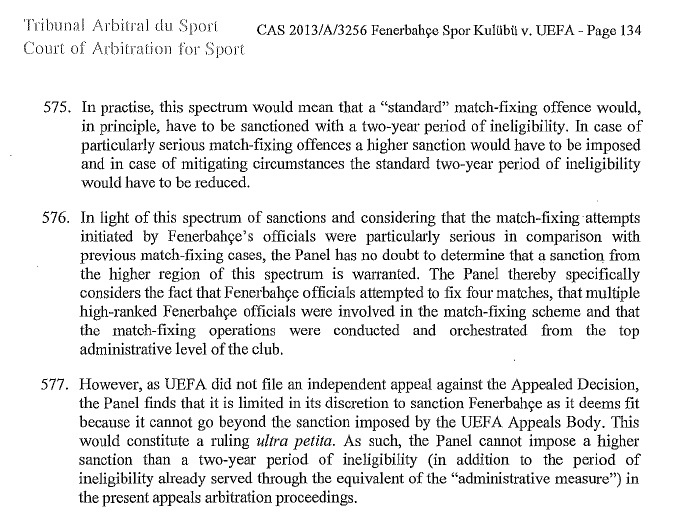 The following clauses are taken directly from CAS report on Fenerbahce SK vs. UEFA case and clearly state that UEFA not only penalised Fenerbahce SK with the least possible sanction, but prevented CAS applying a sanction that precedent suggests should have been up to eight years’ ban from European competitions. These tougher santions were never an option once Uefa had decided not to file an independent appeal. The ruling, from which the extracts above are taken, have never been made public via official channels. The UEFA website has also removed other material previously published about Fenerbahçe and fixing. Sportingintelligence contacted CAS to ask why the verdict has not been published. At the time of writing, CAS had not responded. Edit, addition: Since publication of this story, a CAS spokesperson has clarified: “Please be advised that an appeal has been filed against the CAS decision at the Swiss Federal Tribunal (SFT). Until the SFT delivers its decision, the CAS has decided not to publish the award.” Addition ends. Some fans also argue that UEFA have a duty to help ensure that those involved in match-fixing are forbidden from taking any further role in the game. It has been more than 13 months since UEFA said they would announce the sanctions of individuals involved in the Turkish match-fixing ‘as soon as possible’, but apparently this has not been possible yet. 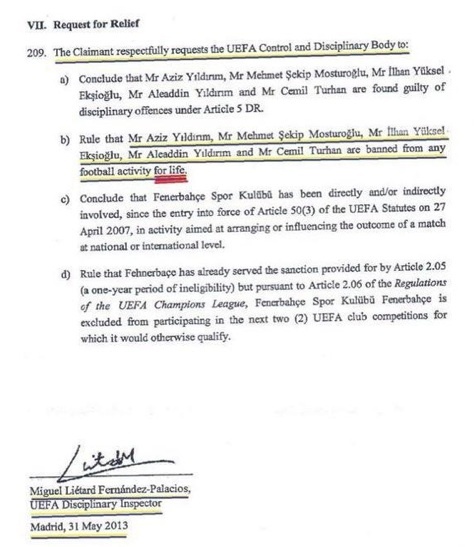 One of Uefa’s disciplinary inspectors, Miguel Liétard Fernández-Palacios, recommended as long ago as 31 May 2013 that five named individuals at Fenerbahçe – including the club president – should have action taken against them, including life bans (see recommendation below). Yet no such action has been taken. And no reason has been given. Uefa referred to the pursuit of individuals in a statement linked here, 13 months ago. The key issue is that although regulations within the disciplinary code of the Turkish Football Federation make it clear that match-fixers should be banned, there appears to be no appetite to apply these. 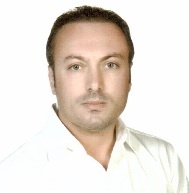 Worse, there appears to have been influential involvement from political figures, and a senior (Turkish) Uefa official to make sure these match-fixers are not dealt with. As we shall explore in a moment, that senior official is Uefa vice-president Şenes Erzik, also a member of Fifa’s ExCo – and a Fenerbahçe fan from boyhood. First let us consider the rules of the TFF. According to the TFF Disciplinary Code 55/1(b): Teams, whose board members are involved in match fixing or bribery, must be relegated to a lower division. Yet the TFF failed to apply this code and UEFA has not applied pressure to make it happen. The TFF signed UEFA’s ‘Astana Resolution’ alongside other European federations on 27 March 2014. According to clauses 5f, 5g and 10 of the Astana Resolution the course of action is clear for the TFF – action must be taken against individuals. According to the Turkish Football Federation Status Article 2/f: The TFF has to obey the verdicts of UEFA and FIFA and make sure all parties guilty of fixing, including clubs, players, managers, officials and so on, also adhere to these verdicts too. They have not. 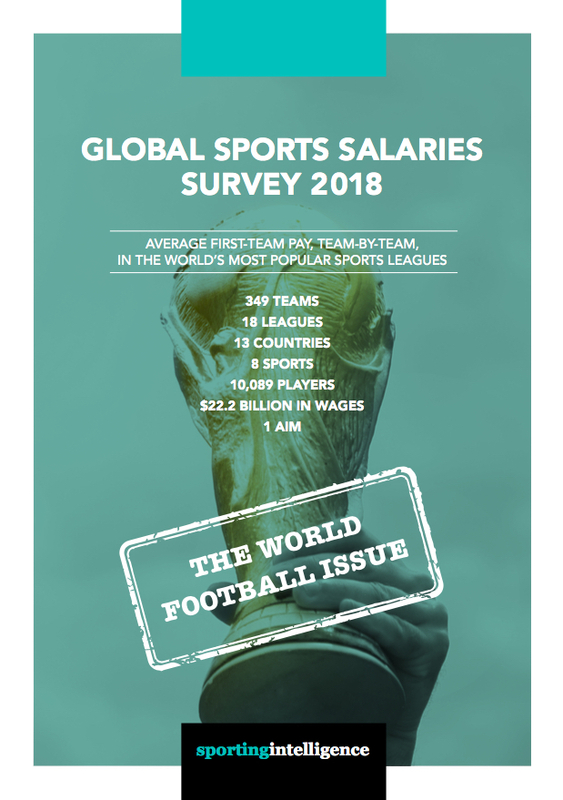 The TFF’s failure to apply the necessary sanctions to teams and individuals involved in match fixing has been no surprise to those who follows Turkish football because the Turkish Prime Minister, Recep Tayyip Erdogan, has himself stated several times that he wouldn’t let his team – guess which one? Yes, Fenerbahce – be punished. Any rational observer will draw the conclusion that the TFF obeyed his orders and made sure no sanction was applied. A conversation the Turkish Prime Minister had with his son revealed the fact that UEFA vice-president Şenes Erzik used his influence to ensure that Fenerbahce were not relegated, despite the rules being clear that they should face domestic relegation. Another episode in this case that leaves many Turkish fans bewildered was a meeting between former president of the TFF, Mehmet Ali Aydınlar, and UEFA president Michel Platini, in Cyprus. Mehmet Ali Aydınlar told the media he’d had a chance to convince Mr. Platini that a points deduction and not a relegation was the best course of domestic punishment for Fenerbahçe. UEFA’s statutes clearly show why they need to intervene. Obligations of Member Associations Article 7bis: (1) [Fair Play, Statutes, Laws of the Game]; Member Associations shall have the following obligations: a) to observe the principles of loyalty, integrity and sportsmanship in accordance with the principles of fair play; Member Associations shall include these obligations in their statutes, as well as a provision that leagues, clubs, players and officials shall observe these obligations. Previous serious fixing cases give UEFA a precedent to act, namely those involving Olympiakos Valou of Greece and FK Pobeda of Macedonia. Olympiakos Valou were relegated four divisions to an amateur league and FK Pobeda were banned from European Competitions for eight years. Article 9; 1) If, in the opinion of the Executive Committee, a Member Association has committed a serious breach of these Statutes or regulations or decisions made under them, the Executive Committee shall be entitled to suspend the membership of the Member Association with immediate effect. Unless the statutes and disciplinary regulations listed above are applied to Fenerbahce and all other Turkish teams involved in match-fixing, it is risible to talk about ‘zero tolerance’ to fixing. UEFA should also consider whether it is appropriate for a vice-president of UEFA, Şenes Erzik, to ask Turkish clubs to back the president of the TFF, Mr. Yıldırım Demiören, in this case, meaning back him in not taking action against fixers. UEFA might also consider whether it is appropriate for a vice-president of UEFA, Şenes Erzik, to talk about his role in the ‘success’ of Fenerbahce staying in the Champions League initially, before their ban. UEFA might also wonder whether it is appropriate for a vice-president of UEFA, Şenes Erzik, to advise Fenerbahce how to take action against UEFA. Or, for that matter, whether it is appropriate for him to opine that there was and is no desire for UEFA to see the TFF punished in relation to this case. Sportingintelligence asked UEFA specifically about the alleged lobbying of Michel Platini by the TFF president in relation to domestic punishment for Fenerbahçe; about the precedents Olympiakos Valou and FK Pobeda and why Fenerbahçe were not also punished so harshly; and about multiple specific alleged interventions by UEFA VP Senes Erzik on behalf of Fenerbahçe to reduce or stave off domestic punishment. UEFA did not provide responses to any of these specific questions. 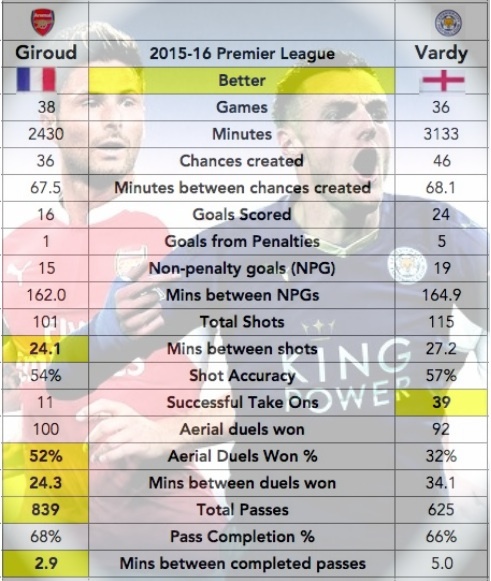 Anyone might think UEFA and their vice-president condone match-fixing.